The 2018 version of CopyCamp will take place on October 5th and 6th in Warsaw. For the past 6 years, CopyCamp has been a place for interesting, insightful and engaging discussions about copyright in the EU. Every year an international, interdisciplinary group of artists, experts, scientists, and activists meets to exchange experience, and show that this law affects everyone. If you would like to join COMMUNIA at CopyCamp please know that the call for speakers is open until until July 31st. You can find more information about that here. Every year CopyCamp has a different focus, for this edition five different thematic tracks have been developed. How to acknowledge and remunerate authors? How to help them to negotiate contracts and secure their career and financial stability in the long run, also during retirement? What are the perspectives of alternative compensation schemes? It is the hundredth anniversary of the modern Polish copyright and industrial property law. The evolution of the law has been accompanied by the evolution of cultural activities regulated by these laws. Are there any lessons that can be drawn? What has changed in culture that the law should address better? Is the new directive #ACTA2? We need to have a meaningful discussion on how to fix copyright that transcends such simplifications. CopyCamp has been the place for such a discussion since 2012. This year you are more than invited to share your proposal for the copyright for the future. How can technology be used to benefit authors and their audiences? Is blockchain the answer? Will it live up to the expectations? Most importantly – what exactly does blockchain fix in copyright, and whom it will empower? Heritage is an important source for appropriation artists, who use it to retell old stories and build their own stories by reusing existing culture. There are not just legal, but also ethical questions in this area. We invite the GLAM sector to share their experiences from digitization and reuse, and we also invite authors and researchers to openly talk about their needs when it comes to building upon heritage. CopyCamp 2018 is organised in partnership with the Patent Office of the Republic of Poland, Society of Authors ZAiKS, Polish National Film Archive–Audiovisual Institute, and Google Poland. It is supported by EDRi, COMMUNIA, Open Knowledge International, and Open Forum Europe. The event is open for everyone and entrance is free. Last week more than a hundred of copyright reform activists got together in Brussels for the the European Copyright Action Days to make it clear to EU lawmakers that the copyright reform effort that is currently being discussed in the European Parliament and the European Council is not good enough. In a series of events organized by Copyright 4 Creativity, Create.Refresh, Communia and others, activists and other stakeholders discussed the shortcomings of the current reform proposal as well as ideas for a more future-proof overhaul of the outdated EU copyright system. As part of the Copyright Action Days we organized a a roundtable on the future of education in the European Parliament, our first ever COMMUNIA Salon on the future of copyright in the Museum of Natural Sciences and two workshops for copyright reform activists. Video documentation by Sebastiaan ter Burg. The roundtable on the the future of education hosted by Dutch MEP Marietje Schaake was a full room event at the European Parliament, with over 40 policymakers and stakeholders attending. We discussed the intersection of educational policy, technology, copyright reform and open licensing policies. Irish school teacher Leanne Lynch talked about the use of technology, social media platforms and digital copyrighted materials in the classroom. Mitja Jermol – UNESCO Chair on Open Technologies for Open Educational Resources and Open Education – talked about how new technologies can support educational goals. Andreia Inamorato dos Santos from EC’s Institute for Prospective Technology Studies presented results of their latest report on open education policies in Europe. Finally, Damjan Harisch from the Slovenian Ministry of Education and Maja Bogataj Jančič, Director of the Slovenian Intellectual Property Institute, presented the position of Slovenian Ministry of Education on the copyright reform During the event, Teresa Nobre also presented our latest research on licences for educational uses. We are happy that we had the opportunity to exchange views on the matter with representatives of publishers and CMOs. The Future of Technology in Education roundtable, photo by Sebastiaan ter Burg. More photos here. This spring the ongoing effort to modernize the outdated copyright rules enters into the decisive fase. It is widely expected that both the European Parliament and the EU Member states will their position on the proposed Copyright in the Digital Single Market Directive. Right now things are not looking good: instead of a much needed update of the copyright framework that would enable new uses driven by technological innovation, policy makers in Brussels are working towards new restrictions that would would limit how information and creativity can be shared and enjoyed online. 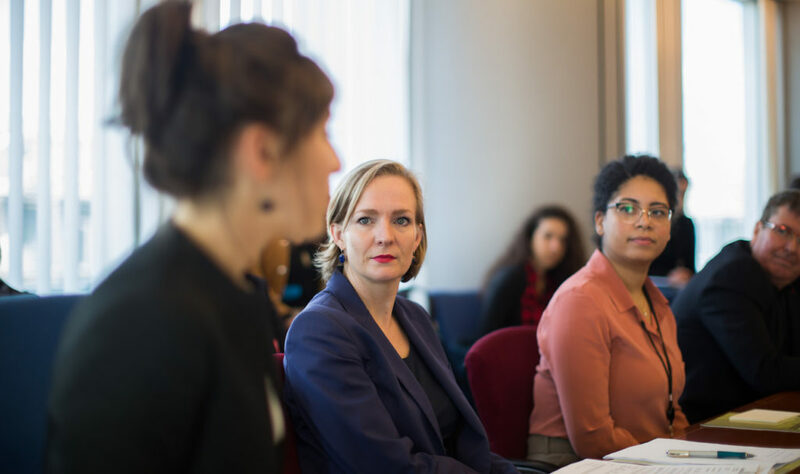 Last Wednesday, June 21st, COMMUNIA organised an event in the European Parliament, hosted by MEP Marietje Schaake (ALDE) on copyright reform for education. We wanted to share one important voice often overlooked in the copyright reform, that of the educator. What is the type of copyright exception that we need to support 21st century education? We heard from practitioners, experts and policymakers during the event. Over 4800 people have supported the petition for a better copyright reform for education to date, and we hope MEP’s will listen to their demands.